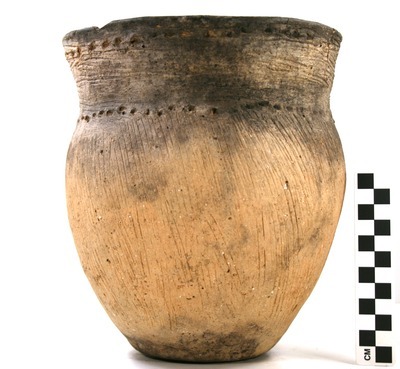 "41UR315, Burial 29, Vessel 152" by Timothy K. Perttula and Robert Z. Selden Jr.
DECORATION (INCLUDING MOTIF AND ELEMENTS WHEN APPARENT): The rim is decorated with horizontal brushing marks as well as tool punctated rows under the vessel lip and at the rim-body juncture. The vessel body has vertical to slightly diagonal brushing marks that extend to within 3.5 cm of the vessel base. Bullard Brushed jar, Vessel 152, Burial 29.